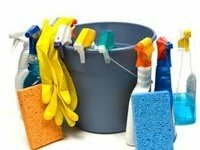 End of tenancy cleaning in London is very important. On one hand, it guarantees the security deposit, which every tenant wants to receive in full. On the other, it prepares any property to let for the next tenant. At Fast Professional Cleaners, we understand the importance of the service and strive to provide it at competitive rates to the highest standard possible. It is very easy for us to do so because we are a company with many years of experience in the field. A huge client base stands as proof of our mastery of cleaning and comprehensive services in London. Tenants know they can rely on our assistance at any time! End of tenancy cleaning services for people who are leaving their rented property are a must. It is often the case for a strict landlord to dislike the state of the place and keep some part of the security deposit. Thanks to the end of tenancy cleaning service in London by Fast Professional Cleaners, you can rest easy knowing that we will clean the place from A to Z. We have a checklist we follow and we guarantee that every item on it will be spotless when we are done. From living rooms to cupboards in the kitchen – everything will be so well cleaned, that even the strictest landlord will feel impressed! To acquire our service, you needn’t do much; just contact 020 3819 5736 and we will be there to assist you. Landlords too can benefit from our end of tenancy cleaning in London! If you own a property to let, you will want to find tenants as soon as possible. One way to do this is to ensure that the property is in pristine shape by hiring our cleaning services. We know how to clean the property in such a way after your tenants have left, that everyone who follows will be more than impressed. Contact 020 3819 5736 to find out more about our work and how we can be of service. Fast Professional Cleaners is the only company you will ever need for end of tenancy cleaning in London.